How to pronounce certain words "correctly" or how we refer to certain things can vary based on what part of the country we're from. That's not news. But thanks to the internet, it's become one of the more amusing subjects to ponder. Is it "soda" or "pop"? "Cara-mel" or "Car-mel"? Surveys and polls have popped up online, on Facebook or wherever, from time to time, but Business Insider took it a step further by laying out a series of maps that break down regional accents and word preferences by area, using a helpful color-coded key. There are 22 maps in total, some of which seem a bit more obscure than others. For example, the soda/pop debate is commonly known, but I didn't realize there were enough people saying "bowie knife" to warrant its own map. "Roof" seems like a more common word to debate, since some pronounce that "ruff," but that one didn't get its own map. Here are a few that did. A lot of diversity with that one. 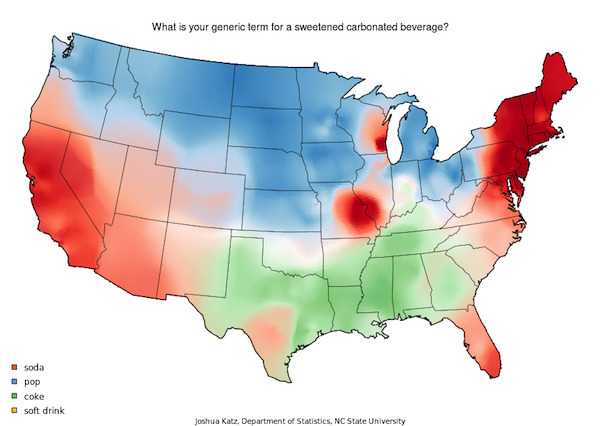 Soda and Pop come out ahead of "coke" as a term for soft drinks, but on population density, it looks like soda probably wins. I realize I'm in the minority here, but it drives me a little crazy to hear merry, marry and Mary pronounced the exact same way. Then again, I've also been legitimately confused when hearing the names "Erin" and "Aaron" pronounced the same way. Pronunciations for those two names may fall into a similar map as the one above. As the map indicates, Massachusetts, Long Island and New Jersey are the only places where marry, merry and Mary are said differently. For reference, for those curious as to how they might be pronounced differently: Marry would be M-ahh-ry, Merry is M-eh-ry. And Mary is M-air-y. Unsurprisingly, Texas and the South make up the area where "y'all" is used most. 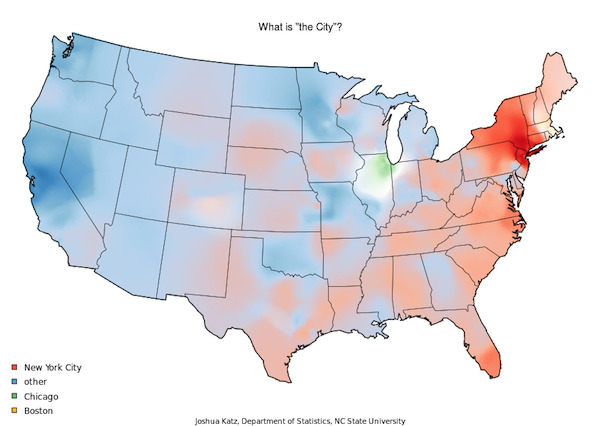 As for referring to New York City as "The City," that's mainly a New York thing, though there are splotches of red spread throughout other parts of the country. In all fairness, New York City shares its name with the State, so it's probably at least partially a way for New Yorkers (state and city) to distinguish the city from the state in reference. Ok, and also because many of us consider New York City to be the city. And apparently, only those of us in the northeast or down in the southern part of Florida are calling athletic footwear "sneakers." The rest of the country is saying tennis shoes. Where I come from (Long Island), "tennis shoes" are Keds - Do Keds still exist? - those white canvas sneakers people wear (or wore) to play tennis and were once cool for non-tennis purposes, especially if you decorated them with puffy paint - (80s!). All other athletic shoes (running, walking, etc) are referred to as sneakers. But what's kind of funny is that none of those words are very logical. "Sneakers" sounds made up, 'tennis shoes" sound like footwear to be worn while playing tennis - which I'm assuming is not actually the definition of these shoes as people refer to them - and "gymshoes" (one word?) sounds like something only kids would wear. Business Insider has other maps to check out. Think you pronounce syrup, crayon or pecan the same way as everyone else? Think again!